You want to play when and as you like, without being confined to time or place, Yamaha’s next generation SILENT Brass makes it happen. 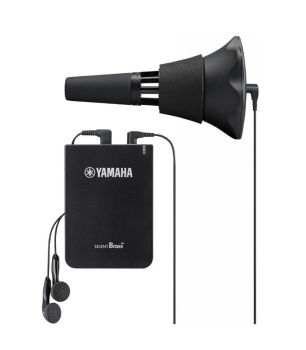 The new SILENT Brass consists of a smaller, lighter, free blowing Pickup Mute, and the Personal Studio, which features Yamaha’s exclusive Brass Resonance Modeling. Used together, the two deliver the natural acoustic tone you hear when playing without a mute, making it feel as though you are playing mute free. Pickup Mute: The Pickup Mute combines a high-performance mute with an internal microphone to pickup sound. Significantly smaller and lighter than previous versions, the mute offers superior muting performance, delivers excellent intonation over a wide pitch range, and natural playability. A new compact design now lets you put your instrument in its case with the mute in the bell. * Please note that the Pickup Mute may not fit some instruments with significantly different bell shapes or bell diameters. Please check before purchasing. Brass Resonance Modeling: The SILENT Brass features Yamaha’s unique technology, which uses the modeling of non-muted brass instruments to correct your instrument’s tone when the Pickup Mute is in place. The resulting sound is so realistic, it’s hard to tell whether the instrument is muted or not. The SILENT Brass Offers More Enjoyment: Connect the output from an audio player, smartphone, etc. to the AUX IN jack on the Personal Studio and enjoy playing along with your favorite recordings or “minus one” practice aids. The PHONES jack can also be used as an output jack for recording what you play. * Stereo mini-to-mini cable sold separately.